Most sales people once were “road warriors.” Rarely in the office, they were out looking for the next big deal. Things have changed, and today many of us spend an increasing amount of time at our desks and with ever-growing number of unread emails. (Or is it just me?) I’ve put together a short list of tools that help to get organized and win more time for talking to customers. If you have set activity goals, which you should, make sure you’ve allocated time for getting them done. The main reason for underperformance is bad execution, not lack of sales skills. Setting a schedule helps to organize your week and ensures that you don’t miss meetings or calls with clients. There are lots of calendars out there, I’ve ended up using Google Calendar because it syncs well with other software. If you let your inbox dictate what you’ll get done each day or week, chances are slim that you’ll get anywhere. There are a couple of tried and tested email/Gmail tools that can help you stay in control over your inbox. My personal favorite is SaneBox. It helps you focus only on important emails. And it really delivers on that promise! 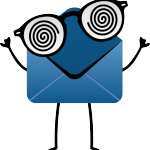 It’s like hiring a little invisible robot that cleans your inbox after it has analyzed your contacts and email behavior. SaneBox has assessed a couple of emails incorrectly for me, but it learns as you go, and it gets better. Boomerang for Gmail gives you the option to clear certain messages out of your inbox until you need them, as well as set reminders to follow up with a client if you haven’t heard back in time. I know many of our customers use it. Yesware is another Google add-on that may be useful in sales. It shows how clients are responding to your emails and which messages are opened and shared. It also gives you the opportunity to create customized email templates, for example a template for a cold email to a new prospect. Last but not least, Yesware allows syncing all your emails to the CRM software of your choice. See Timo’s post about it. It never ceases to amaze me how fast a day can go, without getting much done. If you’re not sure where your time disappears, check out Rescue Time. It keeps track of all your activities and shows where you could be wasting time. Furthermore, with the Focus feature, you can choose how much time to spend on a certain task. If you fall off course it can even block access to websites like Facebook or your email account. Sales software should do more than be a register of your customer data. A good sales CRM shows how well or poorly you are doing and helps you benchmark against your goals and focus on the deals that need attention. And it shouldn’t slow you down with endless amounts of menus, options and confirmation boxes. We’ve poured our hearts into making sure Pipedrive helps to do all of the above, but of course we’re not the only game in town. Any of these tools can help you increase productivity, but bear in mind that different tools work for different people. It’s best to try several and stick to those that work for you.